The repairs performed with Kerasys® LC should have the same demand of high quality as you expect from your products. The basic of this philosophy is, that the color of the repair material comes very close to the color of the ceramic objects. Kulzer performs FREE measurements of color and glaze in its own R&D laboratories to chose the best color for your object out of more than 200 standard colors. If we cannot offer a standard color, we can provide an individual color matching service for corresponding purchase quantities. To ensure a maximum of quality please use our FREE color and glaze measurements. we perform the measurements of color and glaze to choose the best color paste for your object. Subsequent to this we send the repaired tile as a reference back to you. Now it´s your decision about the result! If we cannot offer a standard color, we can provide an individual shade matching service! 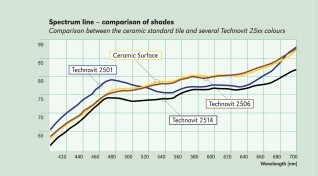 The more flat the surface of your sample tile, the more accurate the color measurement!